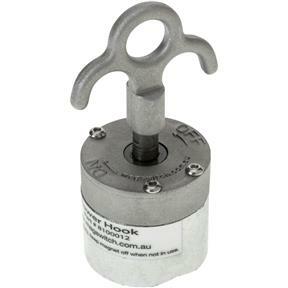 Magswitch magnetic utility hook with 25lbs/11kg holding power on 1/4"/6mm steel. 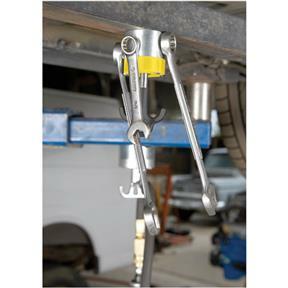 Lets you hang tools, lights, nuts and bolts within reach. 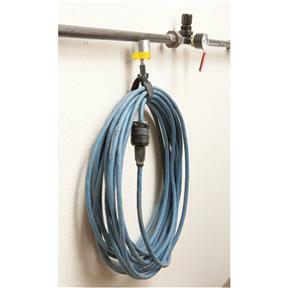 Use it for job site safety to keep your work area clean - support wires, air hoses, ground lines and avoid trip hazard by keeping them off the floor. 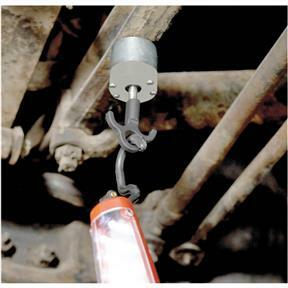 Featuring the patented Magswitch® technology, offers complete on/off control so steel dust just falls off. From Mechanics, to shop keepers, to farmers and DIY - you'll love your Magswitch helping hand. These mag switches were on a really good sale so I bought 5. They do the job. They're not as powerful as I would've expected, probably because of the cutout so they can be placed on piping. But they are strong so I'm glad I bought them especially for the price. I'll put them to good use. Did I really need a magnetic hook? No, but being a tool freak I bought one anyway because it was very inexpensive. It is really cool and I have actually found uses for it in my office that I did not think I would ever need. I purchased these for work and they are better than advertised. The bases are notched to work well on uneven or round surfaces and the locks are excellent. I will be purchasing more of these in the future and recommending them to my counterparts around the country. Mag can be used for more things that you could ever think of ! I bought this as a gift for my husband - not sure whether he would like it or not. He loves it and says it has come in handy many times. A little smaller than I anticipated but a fairly strong magnet makes these mag-hooks a winner. Really helped my issue with keeping light in tight spots. these are working just as I need. and at a much better price then other I have seen. these magnets are fairly strong they work for hanging lights and work from the metal ceiling in my shop and I plan to use them in my shop for attaching things to the saw tables. Had these in my woodshop now for about two months. I use them for the designated purpose of holding things up but that does not limit their usefulness. I use them on my cabinet saws, bandsaws, planers, and jointers. Anyplace there is ferrous metal and I need to guide something or hold it down these magnetic utility hooks do the job.The "T" handle is very easy to use to turn the mag on and off. I also use them when taking photos of products against backdrops. Instead of setting up a stand I can simply grab the desired backdrop and mag attach them to a metal shelf and viola, an instant backdrop for a quick photo. Quick twist of the handle and I have quickly turned my photo "studio" back into my woodshop. Could not be happier and since they were on sale I am kicking myself for not buying at least a couple more. Does exactly what it says it does...does it pretty good too! 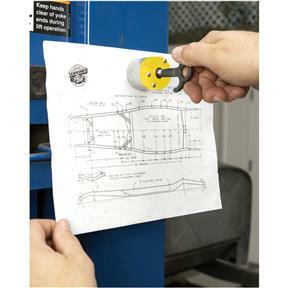 I bought two of these and use them with a bunge cord to keep a 4" dust hose on my bandsaw. Wish I bought a couple more because I find I move them to different tools. Saw it on sale just had to have it in my saw restoration business.